After more than 20 years of dreaming about returning to the land of my birth, I finally made aliyah (immigrated to Israel) with my family in January of 2011. Starting a new and exciting chapter in my life has been exhilarating, scary and an emotional roller coaster at times. I live in the beautiful Galilee, on Kibbutz Hannaton, a small, egalitarian and pluralistic kibbutz, full of life, joy and hope for a wonderful future. My family has settled in nicely and we love our new home. My dream has always been to learn about the richness and beauty of this land, and to explore Israel’s role as the crossroads of history, religion, culture and people in the Middle East. I wish to do my part in bringing together Jews, Arabs, Christians, Muslims, Israelis and Palestinians and creating the peace we all crave. I believe we can co-exist, live side by side, sovereign nation by sovereign nation, with respect, dignity, security and prosperity. My first step, therefore, was to become a licensed Israel Tour Guide. I started the intensive, absolutely fascinating, 18 month course and studied – geology, geography, history, archaeology, the Bible, Judaism, Christianity, Islam, botany, zoology, prehistory, art, architecture, Greeks, Romans, Jewish history, and much more– 10 hours in class every week. And best of all, every Monday we went on a day long field trip, every week to a different area, different sites, 6 a.m. to nightfall, walking and studying the land. I studied as I had never studied before, and then passed all the required national exams. 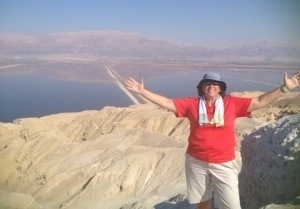 I am now a licensed Israel Tour Guide and through this blog I want to entice you to join me on this journey of discovery. I will write about some of the places I visited and the wonderful things I learned. And when you decide to come to Israel, allow me to be your guide to this land, the Crossroads of the World! Love it!!! good luck Anat. It seems like you are having the time of your life. I am so happy for you. Great! Good luck with you studies, sounds fascinating. I also want to show tourists a diverse, multicultural, pluralistic Israel. Maybe we can work together in the future. I haven’t thought so much about how arranging it, but since I speak the Scandinavian languages (Danish as my mother tongue), I was thinking establishing a niche for the Scandinavians. If you want to talk more serious about it, not necessarily about making something specific, you are welcome to write on my email, shmuary@gmail.com. I’m going through the archives and I am finding so many incredible places I have yet to see! Great blog – keep posting! Mazel Tov. Keep up the good work! !